When Chris Rock hosted the Oscars he made a joke at the expense of Jude Law’s over-abundance of movies that particular year that went from funny to mean-spirited in roughly thirty seconds flat and when Sean Penn took the stage that night, he called him on it. While I, like a good majority of filmgoers became first enamored of Law in his Oscar nominated role opposite Matt Damon in The Talented Mr. Ripley, he became—whether fair or not—the subject of the celebrity tabloid gossip and paparazzi regime and Law the movie star was born. Rock had a point that we were inundated by Law and his choices (Alfie, a remake of the Caine classic?) were questionable but it wasn’t until he tackled the role of Milo Tindle in Kenneth Branagh’s remake of thirty-five year old Sleuth that I realized why or maybe more accurately, once again just how appealing Jude Law is on film. In Sleuth, he’s Law in Ripley and Damon in Ripley combined—the consummate actor, the charismatic chameleon going from seductive to frightening right before our eyes and, much like Rock’s joke, often in just thirty seconds flat. Maddeningly, Sleuth is a talky and artsy film that audiences won’t seek out and it’s a British endeavor as well that some critics may feel is too theatrically self-conscious to endorse which is a shame because it features the best cinematic work Law has ever done and as I write this review, hands down, the most impressive acting I’ve seen in 2007. 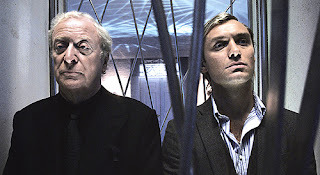 Of course, in all my gushing, I haven’t even mentioned the immeasurable Michael Caine who intriguingly takes on the opposite of the role he had in the original when he played Milo for director Joseph Mankiewicz in his 1972 adaptation by Anthony Shaffer which was based on his play. As Andrew Wyke, Caine is both restrained and coldblooded, coiled like a snake that takes forever to strike and it’s a joy to watch him tease and verbally volley back and forth with Law from the get-go as the pompous and successful crime writer who lives like a recluse in his strange mansion in the country with its cool minimalist furnishings all run by little remote controls that operate lights, cameras, ladders that drop down from the ceiling and more. As the film opens, the young, handsome struggling actor Tindle arrives at Wyke’s estate and it only takes a few choice phrases to realize that they share the same woman—Tindle is the dashing lover that Wyke’s estranged wife has taken on and there’s more than a little bit of jealousy, anger and curiosity at work as Wyke does his best to challenge the suitor who came with the intention of trying to get Wyke to release his wife with a divorce. Of course for a man like Wyke, freedom, even when he’s the one who’s been rejected, does not come without a price and the audience as well as Tindle holds their breath when his diabolical scheme is first introduced. Those familiar with the original film will recall the battle of ego and puzzles that ensue, which get increasingly dangerous as the film continues but in the hands of Nobel Laureate of Literature, author Harold Pinter, it all feels deliciously nasty and fresh and he manages to throw us for a loop with a much discussed new twist near the end that feels at first surprising but after one considers it, very justified given some of the subtext earlier on in the piece that was also evidenced in the Shaffer play. While Branagh’s film runs a brisk eighty-six minutes as opposed to Mankiewicz’s original Sleuth, which went longer than two hours, that’s about the appropriate amount of time to effectively suspend our disbelief as well as keep us wanting to watch these two dangerous macho schemers. Coming off the heels of the slight but gorgeous As You Like It, Branagh is at the peak of his powers as a visual storyteller utilizing the same trusty production designer he employed on Like It as well as his superior Much Ado About Nothing and the masterpiece Hamlet, Tim Harvey. Harvey’s production design along with the superb, cool and masculine edges of the furnishings and all of the high tech gadgets from set decorator Celia Bobak (who worked on the newer version of Phantom of the Opera) is practically a third character in its own right, crisply photographed by Venus cinematographer Harris Zambarloukos. However, the real revelation of the piece is Law who takes a more subtle and teasing approach in the first half and then sneaks up on us with his tour de force evidenced in the final act.